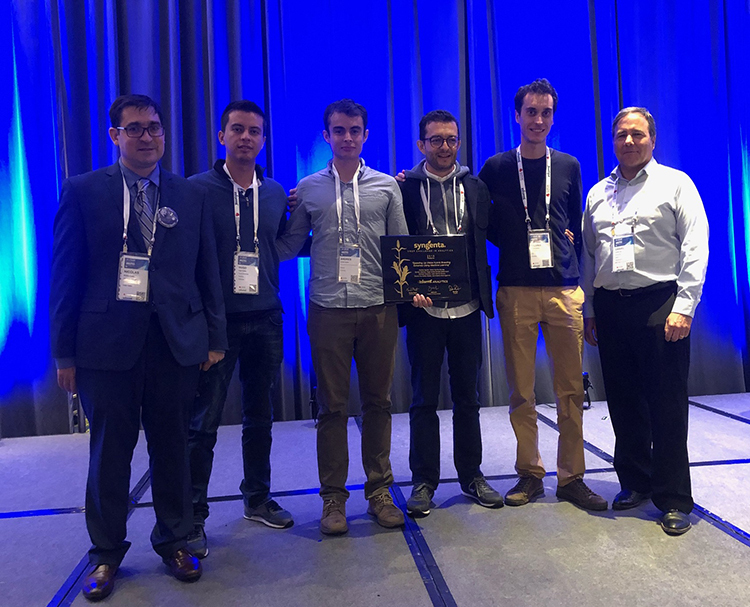 RESEARCH TRIANGLE PARK, N.C., USA, April 18, 2018 – Syngenta and the Analytics Society of INFORMS are proud to recognize a team from The International Center for Tropical Agriculture (CIAT) in Colombia as the winner of the 2018 Syngenta Crop Challenge in Analytics. The competition, hosted by the Analytics Society of the Institute for Operations Research and the Management Sciences (INFORMS), concluded during the 2018 INFORMS Conference on Business Analytics & Operations Research in Baltimore, Maryland, where five finalist teams presented their submissions to the Crop Challenge prize committee. This year’s Challenge asked participants to use a real-world dataset to develop models that predict how well corn hybrids will perform in untested locations. Finalist teams from Brazil, Colombia, Germany and the U.S. presented their models, which have the potential to help plant breeders make better decisions regarding which hybrids to advance commercially and provide to growers—while confronting the ongoing challenge of field-testing limitations. The team represents CIAT, a not-for-profit research and development organization that aims to reduce poverty and hunger in developing countries by helping farmers improve crop production sustainably. The submissions were evaluated by the prize committee based on the rigor and validity of the process used to determine optimal corn hybrids, the quality of the proposed solution and the finalists’ ability to clearly articulate their approach. The runner-up submission, “Bridging concepts from Bayesian theory, Artificial Intelligence and Genetics: A novel Bayesian Network methodology for predictions and decision-making,” authored by Jhonathan Pedroso Rigal dos Santos from Brazil, received a $2,500 prize. The third place entry, “Genotype - Environment Interaction (G by E) Analysis using Deep Neural Networks Approach,” authored by Saeed Khaki, Hans Mueller and Lizhi Wang from Iowa State University, received a $1,000 prize. “All of the finalists brought an exceptional level of sophistication and creativity to their entries,” said Nicolas Martin, assistant professor at the University of Illinois at Urbana-Champaign, Crop Challenge prize committee chair and member of INFORMS. “These insights from data analytics experts can help us solve some of the complex challenges found in agriculture." The Syngenta Crop Challenge in Analytics was established in 2015 with funding provided by prize winnings awarded to Syngenta in connection with its receipt of the 2015 Franz Edelman Award for Achievement in Operations Research and the Management Sciences. The competition aligns with Syngenta’s commitment to make crops more efficient – one of the tenets of The Good Growth Plan, a global initiative to improve the sustainability of agriculture. Syngenta supports but is not a sponsor of this INFORMS challenge. Entrants must read and agree to terms and conditions of the challenge, found with the registration mate materials.